Click on users under settings. Click on the user you want to review permissions for. Click on the lock icon on the profile page to open the permission menu. See an explanation for each individual permission in the sections below. 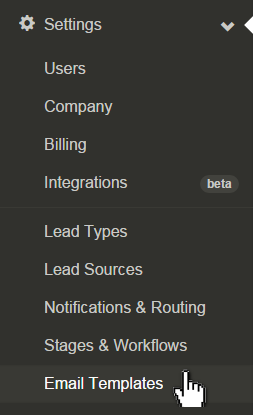 You can modify permissions for each lead type for each user so that if Agent A is on multiple teams you can have granular control over what level of control they have for each lead type. When the permission is turned off this button is hidden. This permission gives the ability to reassign leads. When this permission is removed, the assignee field on the lead record will be locked down. This permission gives the ability to delete leads. This permission gives the ability to view leads assigned to others. This permission gives the ability to see unassigned leads. This is required to claim unassigned leads. When a default assignee is not listed in the notification order, leads that are not immediately responded to will be left unassigned and therefore invisible to anyone that does have access to this permission. When this permission is removed, users will not have the ability to edit or update the contact information for a lead. 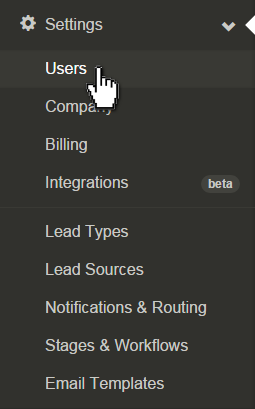 Keep in mind that non-admins can't view the lead sources page under settings regardless of whether or not this permission is given. 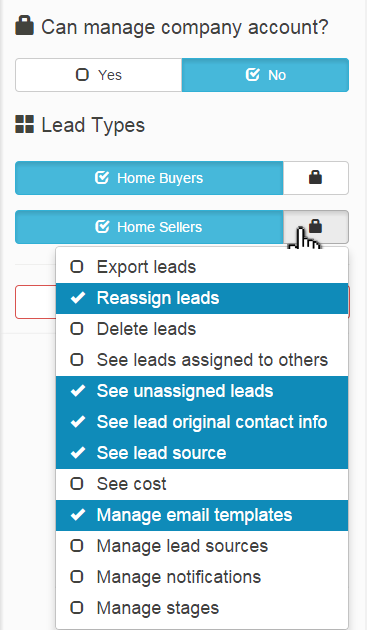 This permission gives the ability to view the lead cost for each lead. This information is visible under the details section of the lead record. This permission gives the ability to view and edit email templates. This DOES NOT affect the ability to use email templates, only editing them. The email templates page is found under the settings tab. This permission gives the ability to view and edit the lead sources page. This permission gives the ability to view and edit the notifications and routing page. This permission gives the ability to view and edit the stages and worflows page. Click on a specific user. On their user profile, check 'Yes' under 'Can manage company account?' in the top right. Only admins can grant admin status to other users.